Cupcakes 'n Daisies: Red and White Tribute Quilt - The Final Chapter . . . . It is truly amazing Thelma! WOW! You achieved everything you set out to do! There's a big check on your Bucket List...LOVE it! Oh wow - it is stunning. I loved the pictures from the exhibition and have followed your progress making the tribute. I love how it has turned out. When I started embroidering way back my Mum gave me my great-grand mothers embroidery patterns and they were very similar to your quilt. One color only on white and graphical patterns. Seing your quilt being created was just amazing. This quilt was WELL worth the wait! It is just wonderful. Thank you for sharing your process, too. WOW! Your quilt is fabulous. Congratulations. It's a beauty Thelma! I've enjoyed seeing each mini-quilt but couldn't envision how you'd put it together. How are you going to have it quilted? Well done Thelma -- it's absolutely beauiful! That is just the coolest thing!!! I feel like I was at the show!!! And it is absolutely breathtaking! Thanks for sharing your journey and the final wonderful result! Just awesome! What a wonderful tribute to the show! Perfect!! You did an amazing job on your tribute quilt Thelma. Fabulous Thelma! Definitely has the same feel as the show and is so lovely too! Such tiny pieces! Perhaps yours needs to be included in the Red/White show next time?! Fantastic! I love how you put it together. I would have never thought about the tape to outline your canvas. I had mentioned that I was having trouble understanding the final product but it all makes sense in the end. The visual you had in your head guided you along the way. Did you applique the pieces together? How did you piece the layers together? Honestly, it is outstanding. Congrats on the finish. It was well worth the wait!! This quilt is so beautiful and unique. I have very much enjoyed watching the process of it coming together into a stunning finish. Thank you for sharing the story of this quilt. Wow, such a creative and original quilt! I enjoyed seeing each piece on your blog as you made it but could not visualize how they were all to come together. I love how you used the photo of all the quilits hanging in an overlapping manner as your inspiration. Really special! OMG . . . it is just incredible !! . . . I love love love it !! and I love the way your mind works . . . you come up with the best things . . .
you should think about photographing it and making postcards or notecards from it . . . I would buy them !! Wow, Thelma, this is one amazing quilt! I hope you are as proud of it as you should be. I'm loving the way my (simple!) red & white quilt is coming along. I smile every time I walk into the sewing room as see those colors. Hey, I really like that stand - I need one of those - where exactly is it? Thanks! Thelma, that quilt is a true work of art. Your imagination and creativity are truly inspiring. Gorgeous!!! Well worth the wait! I have enjoyed seeing the quilt come together and the final result is truly a treasure. I love how you "overlapped" the quilts. Thanks for sharing your progress and the final result. I do believe you've captured what you were seeking - it's stunning! Wow! Truly one amazing quilt! Would love to see it in person! Thelma, you knocked that one right outta the park! It's just beautiful! And I love how you combined all the designs into one quilt. It truly is a tribute!!!! OMG!! A truly unique and beautiful quilt. Thanks so much for sharing your progress and your thoughts on creating this wonderful quilt. What a treasure, Thelma! You've chosen the best of the quilt shows, and they all are contained in yours. It's amazing,truly amazing! Unbelievable. That is an immense undertaking, and a glorious success. Fantastic!! I just LOVE your red and white tribute quilt! You certainly were very successful in capturing the feel of that amazing show. I love NYC and have visited it half a dozen times now- I live in New Brunswick Canada, which borders Maine. I didn't know about this show until the week it was happening, otherwise I would have done my best to get there- would have loved to see it. I did get to the American Folk Art Museum in June to see the quilt display but it paled in comparison to the Red and White exhibit.. You now have a fabulous reminder of that awesome show. Congrats!! This is a beautiful quilt! I'd never have thought of a layout like this and I love seeing yours. I love the idea of the quilts being seen behind each other. Beautiful, beautiful, beautiful quilt! Stunning quilt! I think you achieved your objective. It's a work of art! This is truly an amazing work of art. I am wondering how you finished the edges, as it has no binding? Thelma this quilt is absolutely GORGEOUS & truly one of a kind ! You are a a true artist to have planned and designed this quilt all on your own! I am very proud of you ! CONGRATULATIONS ! This quilt is stunning! So glad I came across your blog. Definitely inspiring! Wow, Thelma, this is very cool! Nothing like what I imagined, much more impressive! I always knew this would be amazing and it even beats that. I could just sit here and look at it for hours. It's so beautiful Thelma! I didn't even get to go to the exhibit and yet I can feel how inspiring it was just by your quilt. This one is really special. When you were doing each small quilt I didn't understand how you had planned to put them all together. I've got to say that shot of the top hanging on the display frame TOTALLY captures the look of the exhibit. Kudos on successfully accomplishing a very complex task and vision!!! The Folk Art Museum should include this piece in the retrospective catalogue they plan to issue next year. What an incredibly cool idea - I love it! Fantastic Thelma! I just love it! Congratulations on capturing your vision so beautifully. Have a happy day! WOW! Amazing! This was defiantly worth waiting for. What an achievement. Just stunning! And it really does capture the feeling of the show. I'm sure many quilters are making red and white quilts this year, but yours is truly unique. And I love reading about the process; your work is inspiring. Just takes my breath away. You did a wonderful job. Be proud! Awesome and amazing! Thanks for sharing all of your work and inspiration. Love red and white quilts. . .I have made only one, but I still walk into the room where is rests on our guest bed just to feast my eyes on it! Very creative work,Thelma! Thank you for sharing your process. It has been fun watching your tribute quilt come together. WOW! What a beautiful quilt. I was even better than I imagined it would be!! And i thought it was going to look pretty darn amazing! Loved your tribute quilt. I also loved hearing the thought process that went into it. Truly, awesomely, and fantastically red and white and creative all over. Well done, and totally inspiring. AWESOME!!! It is so beautiful and the epitome of creativity. Love your quilt Thelmaa. It's not always possible to have a quilt capture thoughts and impressions, much less memories of a significant time, but this quilt sure recreates a personal version of the NY quilt show. Good job. I have enjoyed your journey. It's absolutely breathtaking...a truly inspirational quilt! Fabulous. After seeing the quilt from a distance I was totally blown away with how you were able to achieve your goals with this piece. It's all that and then some. Looking at this put me right back in NYC, staring in awe. LOVE IT! I have enjoyed reading and following the progress of this quilt.. It looks simply wonderful. I have so much admiration for the work you have put into it! Congratulations! Absolutely fabulous quilt! Love your Infinite Variety quilt! WOW!!! I am linking to this post in my blog! This is truly beautiful! I'm speechless, Thelma - this is spectacular! You have really captured the effect of standing in the exhibit hall. Brava! You should be very proud of your work! Wow!!! You've done an absolutely wonderful thing with this idea of yours!! I could easily see it traveling with the show of red/white quilts!!! Bravo!!!! Wow - yuor quilt is just amazing. I have no words. Amazing. Absolutely amazing Thelma! Great job! WOW! That is a STUNNER of a finish! I applaud you, Thelma! It is GORGEOUS! Applause, applause!!!!!!!! Love the quilt, the inspiration quilts in the red/white show, and your amazing imagination to have thought this up!! I like your quilt hanging system, too. Did you make it? This quilt is unbelievable! Beautiful! Breath taking! WOW! Wow, Thelma! This is such an amazing quilt. It really looks like the show, with all the quilts hanging in front or behind each other. you should send a picture to the woman who's collection this was. What an amazing tribute! Absolutely stunning .. museum worthy! Totally, totally amazing and you definitely achieved that layered effect! Superb! Okay, now I get it! I have been wondering for awhile what was up with your many red & white quilts. I guess I was thinking they were all full sized & that you were kind of crazy. The finished product is amazing!!!! Absolutely incredible! Stunning! Awesome! Your work is definitely worthy of many show entries and publishing! Congratulations on this one of a kind quilt! You inspire us all!!! WOW Thelma that is just awesome. I love it and you did a great job. I have not been following the creation of your quilt. I am going to go back and read your posts. You have taken traditional designs and turned them into art. You have created the very essence of the red & white quilts show in one piece. Bravo! Astounding! Congratulations on capturing exactly the feel of that exhibit. What a treasure. Truly gorgeous, It makes one feel like it was a part of the exhibt. WOW! Thelma, that's amazing. The creativity and the beautiful of this quilt! Definitely a one-of-a-kind. Standing ovation to you, Thelma!!! This quilt deserves to be put in a major, major, major quilt show somewhere so it can get all the awards and accolades it deserves. I'm humbled to even be considered a quilter when I see work as exemplary as yours. Bravo!!! This quilt is amazing! 22 hours to lay it out? You are one patient woman. This has got to be one of the most beautiful quilts and ideas I've ever seen. So unique. A quilt no one will ever have a duplicate of. Thank you for sharing in the process. This is amazing to see! I was pointed to your post by Nicole at Sister's Choice and I am so glad she did. Congratulations on so successfully rendering the Infinite Variety show as a quilt. I cannot believe how well you achieved that goal and I absolutely L-O-V-E the quilt! I've been watching your progress! The result is fantastic! Oh my goodness...it is spectacular! Amazing! It has exactly the look you were going for! Imagine making a quilt that was inspired by a whole show! I don't think there are words good enough for this quilt! It took my breath away! I think this one will go down in history, and it should travel from show to show so everyone can enjoy it. Congratulations on a job well done. Amazing design! Gorgeous quilt. Came here from Bunny Tales, where she said it HAD TO BE SEEN. Wow, I'm glad I did. It's truly fabulous. Wow! This quilt is spectacular! It really looks like layers of quilts. Nothing better than red and white quilts! Wonderful Wonderful! Thelma! I bow to you and your Summer creations! I love the inginuity and your creative process. I love all of your red and white masterpieces! I am so impressed and inspired. I don't know if anybody really knows how hard it it to work with just 2 colors. It is a challenge in itself! Excellence! Your rock!!! Oh my! This is just gorgeous! Wonderful!!! What a wonderful way to remember all of the beautiful quilts! It is truly inspiring! The idea and the composition just came together so fabulously! All those tiny pieces. I think you may have just invented a new style of sampler quilt. LOVE IT!!! Oh my gosh, this is an amazing quilt. And such a wonderful way to remember the exhibit. Thank you for talking us through the process too, its always nice to understand how the design process works for different people. What a beautiful quilt. It's wonderful and you should be proud. Congratulations! Very impressive! I don't think I would have even thought of designing a quilt like this, much less actually making it. It's really gorgeous in addition to being incredibly unique. Yowza, this is just gorgeous! Congratulations on both creating something so original and on actually completing it. It's definitely a quilt to be proud of. This is one of the most creative ideas I've ever seen. It is stunningly beautiful and quite amazing. Anne Sutton sent me here and I am so glad. Congratulations! WOW! and WOW! again!! I've always been impressed with your creative blog and I've watched your progress on this quilt- it is breathtaking. Thank you so much for sharing the journey. Your quilt is just wonderful. amazing! it is so beautiful! thanks for sharing. Thelma--this quilt leaves me speechless & breathless. It is just so creative and wonderful I don't know what to say!!!! !A work of ART!!!! Beautiful, fabulous, stunning and everything else that you can think of to say about this quilt. Wow, this is amazing. It makes me feel like I'm right there at the show all over again! You're quilt came out amazing! Love every inch of it :) How creative and artistic your design was. Bravo!! Eeek! It's amazing - I love it! Can't wait to see how you have it quilted...you should enter this in a show! 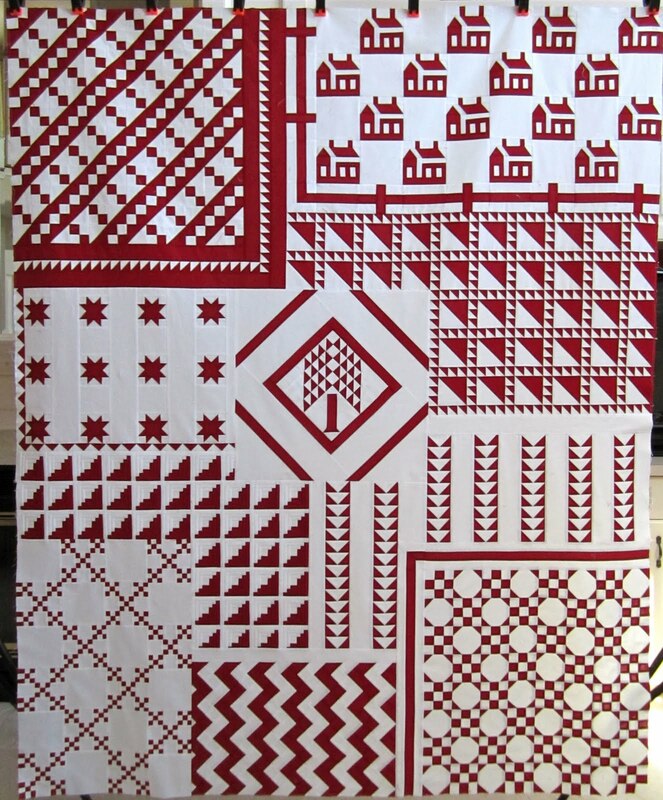 Hopped over from Bunny tales... beautiful red and white quilt. Your design is amazing. And if you look, you do have polk-a-dots--white ones. 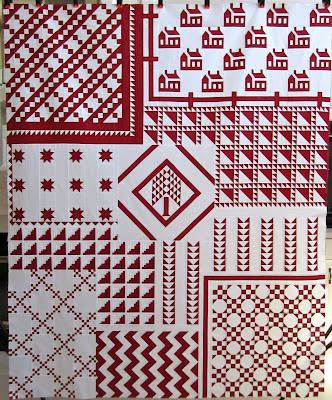 I love your quilt and it did exactly convey the feel of the red and white quilt show. I am impressed with your interpretation. You should be proud. Thanks for sharing with us. Heard about this quilt on Bunny Tale - WOW! what an amazing job and what a perfect tribute! Your quilt is truly a tribute to the show and to all red and white quilts. It is a remarkable work of art. Just gorgeous!!! Truly, a work of art, Thelma. Thelma - it was so much fun following the creation of this quilt - and I love it!! What a great job you did. Thanks for so much inspiration thru your blog. Absolutely stunning! Have you thought of doing a book on just this quilt? I would be first in line just to have it to look at and perhaps one day.....Bunny Tales was right! You just have to see this quilt! This quilt is absolutely stunning.